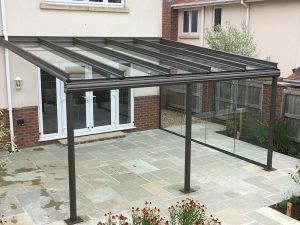 The Weinor Terrazza is a glass and aluminium roof structure built with all year round patio protection in mind for use on any terrace or patio area in a domestic or commercial environment. 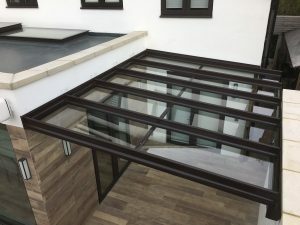 Covered by protective layers of toughened glass to optimise the full use of daylight, the Weinor Terrazza can extend your patio outdoor use no matter what the weather, day or night. Enjoy spending your time outside? The Weinor Terrazza allow you to continue doing this throughout the rainy days and offers you extended hours on your terrace throughout the year and with appropriate lighting, into the night, as well. During the summer months, the Weinor Terrazza can help your patio become an extension of your living, dining and entertaining space regardless of the weather. 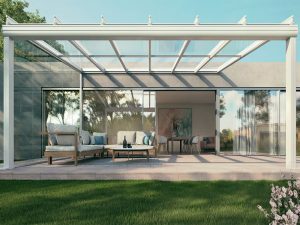 Anything from parties, barbecue’s to reading outside and simply enjoying what nature has to offer – the Terrazza can allow you to enjoy all of this with it’s solid & waterproof glass roof structure. Furthermore, expensive patio furniture can be left outside without fear of it getting wet. It really is the ultimate extension of your property! 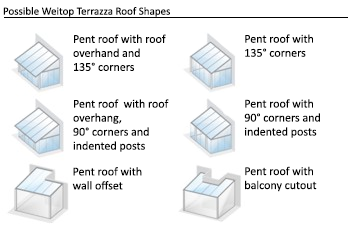 How can I help to shade my Terrazza? There are several different appliances which can be used in conjunction with the Weinor Terrazza. For shading above your Terrazza, we recommend either the Sottezza which is installed beneath the roof or the WGM which provides reliable heat protection mounted above the Terrazza. The Sottezza acts as an under-mount anti-glare screen for your Terrazza. It blends in perfectly when combined with a glass room and is suited for use in well ventilated rooms. The WGM performs as an externally mounted thermal protection source.To vertically shade your Terrazza from the sun, we recommend the Aruba Drop-Arm Awning or the VertiTex blind system.Tucking away neatly when not in use, the Aruba Drop-Arm Awning provides effective protection against both the sun and prying eyes.The VertiTex is the perfect sight and anti-glare screen. By adding a fabric from the heat-controlling Soltis collection, you can still see everything on the outside but are completely hidden from those on the outside.There are a wide range of weather sensors available for motor-driven awnings; sun sensors, sun and wind sensors, sun wind and rain sensors. Depending on each individual sensor, they automatically open/close the awning when sun/high winds/rain are detected. But how will I be able to use the Terrazza Roof in the dark or during cold temperatures? Simple. 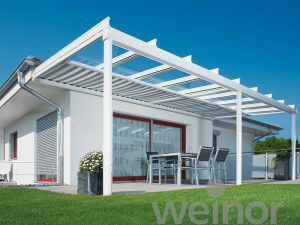 Weinor have produced a fantastic range of products allowing you to combine both heat and light elements into your Terrazza. The Lux light bar system offers high quality lighting and the Tempura heating system provides a warm heat during the cold months. View the Weinor Heating and Lighting Solutions for more details. We can also offer air conditioning units providing heat during the colder months and further enhancements for the enclosed room can include brush seals for the glass doors. Ultimately of course you add from a choice of side sliding or folding glass door systems to give you the option to close up completely and form a glass outdoor room, the ‘Glasoase’, for the ultimate in making the most of your beautiful garden and patio areas. Although this is a single glazed room do not underestimate the amount of use all year round and bear in mind this is an area best enjoyed in the spring, summer and Autumn months when it is simply nicer to be outdoors as much as possible enjoying the sights, sounds and smells of the outdoors. The winter months can also be superb when the sun shines and the air is crisp and cold but inside your glass room the temperature will soar with the smallest amount of sunshine. 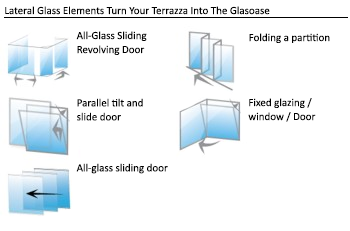 I have an obstacle restricting me from installing a Terrazza/Can I have a different shape? Weinor have created multiple bespoke designs to allow the Terrazza and Glasoase structures to accommodate for wall offsets, corners, balcony cut-outs and more. More bespoke designs are available on request. For further information, please call us on 0800 328 6250. View our other Fixed terrace cover options with links to the right. The Homestyle is the most basic fixed terrace roof cover system we supply and offers excellent value for money.The Piazza and Terrazza have far more design and material involved and have components physically larger. They also have built in rainwater guttering in the front profile section.